When your favorite band last released some music in the early 90’s, it’s fair to say there’s not going to be lots of fresh news of the band pumping through the Internet capillaries on a daily basis. The Feelies are my favorite band. The Feelies album The Good Earth has been my favorite album for almost twenty freaking years. If you’re curious, one of my Green Monkey Mixes, Speed It Up has two excellent cuts from The Feelies (one from The Good Earth, one from Crazy Rhythms). I know it’s possible to set up Google Alerts, what have you, to keep yourself up-to-date with breaking news regarding a topic, but I have never felt the need to do such a thing. For whatever reason, today I decided to do a blog search on “Feelies”. Holy crap. This photo was taken last month. The Feelies are back together. That’s the elusive Bill Million second from the right. In my search I discovered that The Feelies are playing at Maxwell’s in Hoboken, NJ on July 1st and 2nd (they’re also playing with Sonic Youth in Battery Park on the 4th). I had promised myself that if the Feelies ever had a full-fledged reunion, I would travel from Chicago to see them. And that’s what I am going to do. I bought two tickets online today. They went on sale on April 23rd. I checked later in the day and both shows were sold out. Can you believe my luck? I happen to search for the Feelies, discover a full-fledged reunion, and buy tickets for that reunion before they sell out. Holy crap. I’ll probably be flying into NYC or Newark on the 1st, and fly out on the 2nd. Hot damn tamale am I excited. This entry was posted in feelies, rock 'n roll, yeehaw. Bookmark the permalink. ← Where’s The Meme, Boy? Where’s It Hiding? That’s pretty amazing. I love this kind of serendipity. If you need a room, try hotwire. I got a nice room at the Newark Hilton for $75 a night a couple of weeks ago. Haven’t listened to The Feelies in forever. I’m going to have to dig out some cassettes! Hmmm … who was the producer on The Good Earth Oh, yeah — R.E.M.’s Peter Buck! I like your style. 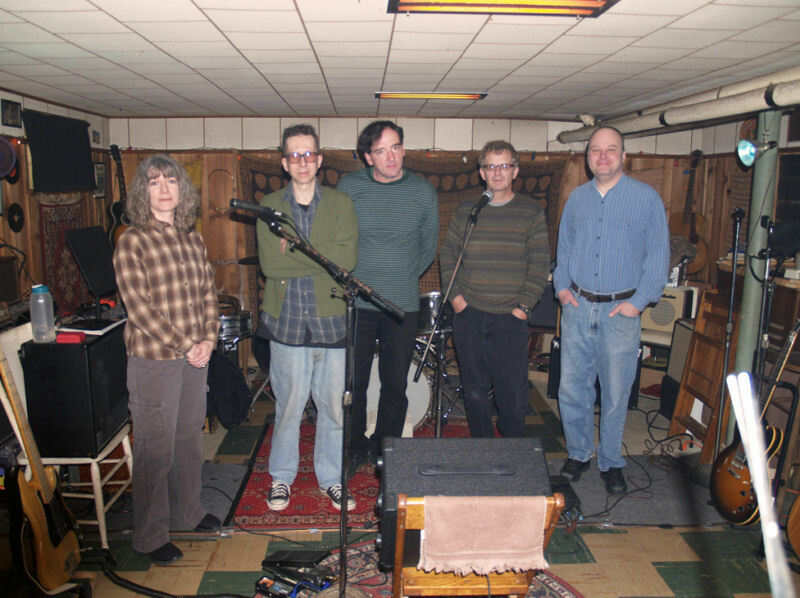 And this picture of the Feelies. And your comments on other blogs. And the way the grass smells after a spring rain. For all of these reasons and more I will be back soon. That is so great for you Splotch- it was clearly meant for you to go. Oh how I love….. Love…….lurve…..love, did I say love the Feelies. dcup, I will check out Hotwire. Thank ye kindly. beth, yes yes yes, Peter Buck is the messiah. We know this. I don’t know if they’re touring. I’ll feel a little silly about traveling to New Jersey if they end up coming to Chicago, but not really all that silly. falwless, aw shucks. I have linked to you and have subscribed to your RSS feed. Yes, I am really that magical a person. d, you bet I will! fran, it’s going to be an amazing day, I think. splotch — while i am not a feelies fan — i can take you to a NYC dinner and you can show me what negative signage is…. I had never heard of The Feelies before. What rock was big enough to block out the light of the sun? That’s the one I have been under. It seems to me that Dcup and I saw the Feelies years ago maybe with Connells. But I must have been too drunk to remember. That’s pretty exciting. I’m getting to see my favourite musical artist (Tom Petty) in June; I’m really excited about it because I’ve never seen him before (his trips to England, where I grew up, were few and far between) and I’d come to accept that I’d never see him at all after he announced his retirement from live shows. I feel your joy! dc, be warned, I might take you up on your offer! freida b, lotsa people have never heard of the Feelies, which is great for me, as it assisted me in purchasing tickets to their show at Maxwell’s. Barbara, I’ll admit, for a minute there, I lost myself, I lost myself. mathman, it sounds like it was a fun evening regardless. the ir, to cherished music, and the opportunity to see it played live!